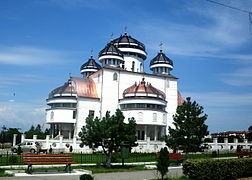 The Archdiocese or Archbishopric of Arad (Romanian: Arhiepiscopia Aradului), formerly the Bishopric of Arad (Romanian: Episcopia Aradului, Serbian: Арадска епархија) is an episcopal see of the Romanian Orthodox Church, under the administration of the Metropolis of Banat, with jurisdiction over Arad County in Romania. The current head is bishop Timotei Seviciu. Aristide Razu, CB, (1868 – 1950) was a Romanian Divisional General, Commander of the 22nd Romanian Infantry Division in the 1916 Romanian Campaign against the Central Powers, and of the 5th Romanian Infantry Division during the Battle of Mărăşeşti, 6–19 August 1917, in World War I. Church of St. Constantine and St. Helena, located in El Hatillo at the south-east of Caracas. It was donated by the Orthodox Church of Venezuela and the Government of Romania to the Orthodox community living in the capital of Venezuela. 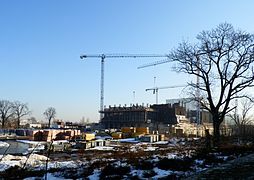 The land for its construction was donated by the Mayor. 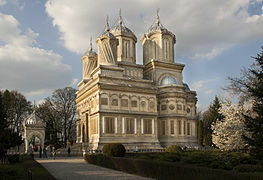 There are only 15 religious temples of its kind in the world and only two of them are outside Romania. 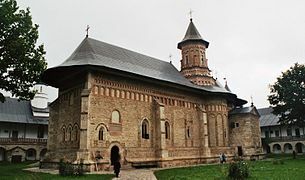 It was built by craftsmen from Maramures district in Transylvania, it was assembled without nails or metal objects in the structure and it is adorned with religious neo-Byzantine paintings. The bell tower rises more than 30 meters. All the pieces of wood for ceilings and walls, were brought from Romania, according sacred traditions to avoid similarities with the hardware and martyrdoms of the crucifixion.It was inaugurated in 1999 and took part in the act Teoctist Arăpașu, Patriarch of the Romanian Orthodox Church at that time. It was decorated by Titiana Nitu Popa and Mihaela Profiriu. 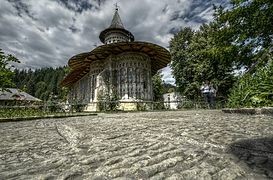 The structure is intended to be a replica of the wooden church of Șurdești, the highest in Romania. The dome is a pictorial representation of Our Lady of Coromoto, patron saint of Venezuela. Lazăr Comănescu (Romanian pronunciation: [ˈlazər koməˈnesku]; born 6 June 1949 in Horezu, Vâlcea County) is a Romanian diplomat. He was the Foreign Minister of Romania from 15 April 2008 until 22 December 2008. He was named Romania's ambassador to Germany in 2009. Since 17 November 2015 he has assumed the functions of Minister of Foreign Affairs of Romania. This is the list of the members of the Holy Synod of the Romanian Orthodox Church, depicting also the organization of the church. The Metropolis of Bessarabia (Romanian: Mitropolia Basarabiei), also referred to as the Bessarabian Orthodox Church, is a Moldovan autonomous Eastern Orthodox Metropolitan bishopric of the Romanian Orthodox Church. The Metropolis of Bessarabia was created in 1918, as the Archbishopric of Chișinău, and organized as a Metropolis, in 1927. Inactive during the Soviet occupation of Bessarabia (1940-1941) and the Soviet rule in Moldova (1944-1991), it was re-activated on 14 September 1992. In 1995, the Metropolis of Bessarabia was raised to the rank of exarchate, with jurisdiction over the territory of Moldova. The current Metropolitan of Bessarabia is Petru (Păduraru). The Metropolis of Chișinău and All Moldova (Romanian: Mitropolia Chișinăului și a întregii Moldove; Russian: Кишинёвско-Молда́вская митропо́лия), also referred to as the Moldovan Orthodox Church (Moldovan: Biserica Ortodoxă din Moldova; Russian: Правосла́вная це́рковь Молдо́вы), is a self-governing church under the Russian Orthodox Church. Its canonical territory is the Republic of Moldova. 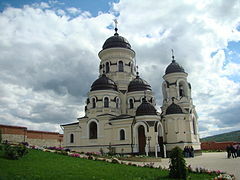 The Metropolis of Chișinău and All Moldova is the largest church in the country, and one of the two main Orthodox churches in Moldova (beside the Metropolis of Bessarabia, a self-governing metropolitanate of the Romanian Orthodox Church). In the 2004 census in Moldova 3,158,015 people or 95.5% of those declaring a religion claimed to be Eastern Orthodox Christians of all rites. The head of the Moldovan Orthodox Church is Metropolitan Vladimir (Cantarean), who is a permanent member of the Holy Synod of the Russian Orthodox Church. The Old Calendarist Romanian Orthodox Church (Romanian: Biserica Ortodoxă de Stil Vechi din România) is an Orthodox Church that uses the old-style Julian calendar. This church was split in 1925 by Metropolitan Glicherie, formerly a member of the Romanian Orthodox Church. 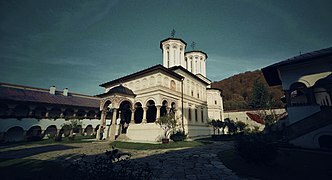 The church is in full ecclesiastical communion with similar churches, such as the Orthodox Church of Greece (Holy Synod in Resistance) prior to its merging with another Greek Old Calendarist church and the Old Calendar Bulgarian Orthodox Church. Daniel (Romanian pronunciation: [daniˈel]), born Dan Ilie Ciobotea ([ˈdan iˈli.e t͡ʃʲoˈbote̯a]; born 22 July 1951), is the Patriarch of the Romanian Orthodox Church. The elections took place on 12 September 2007. Daniel won with a majority of 95 votes out of 161. He was officially enthroned on 30 September 2007 in the Patriarchal Cathedral in Bucharest. As such, his official title is "Archbishop of Bucharest, Metropolitan of Muntenia and Dobrogea, Locum tenens of the throne of Caesarea of Cappadocia, Patriarch of Romania". Nicodim (Romanian pronunciation: [nikoˈdim]), born Nicolae Munteanu ([nikoˈla.e munˈte̯anu]; December 6, 1864, Pipirig, Neamț County, Romania – February 27, 1948, Bucharest), was the head of the Romanian Orthodox Church (Patriarch of All Romania) between 1939 and 1948. The Patriarch of All Romania (Romanian: Patriarh al Întregii Românii; Romanian pronunciation: [patriˈarh al ɨnˈtred͡ʒij romɨˈnij]) is the title of the head of the Romanian Orthodox Church. The Patriarch is officially styled as Archbishop of Bucharest, Metropolitan of Muntenia and Dobrogea, Locum tenens of the throne of Caesarea Cappadociae and Patriarch of the Romanian Orthodox Church. Patriarch Daniel acceded to this position on 12 September 2007. The relationship between the Romanian Orthodox Church and the Iron Guard was one of ambivalence: while the Romanian Orthodox Church supported much of the fascist organization's ideology, it did not outright support the movement. Nevertheless, many individual Orthodox clerics supported the Iron Guard and spread their propaganda. The Orthodox Church promoted its own version of nationalism which highlighted the role of Orthodoxy in preserving the Romanian identity. Starting with the 1920s, Orthodoxy became entangled with fascist politics and antisemitism: the most popular Orthodox theologian at the time, Nichifor Crainic, advocated in his magazine Gândirea a mix of Orthodoxy and nationalism, while philosopher Nae Ionescu argued that Orthodoxy is inseparable from the Romanian identity. Romanian Venezuelans are Venezuelans of Romanian descent or a Romania-born person who resides in Venezuela. The Romanian Immigration in Venezuela started well into the 20th century and deepened in the 1990s. The Romanian community in Venezuela is around 10,000 people. They are mostly immigrants who arrived in the country, like many other European nationalities, following the Second World War and the policies of the governments of the Warsaw Pact. Romanians became adjusted to Venezuelan society, because Romanian and Spanish belong to Romance languages, as well as Romanians' Latin identity. The community is organized into various associations such as Casa Rumana de Venezuela. The Romanian Orthodox Church operates in Caracas since 1997. 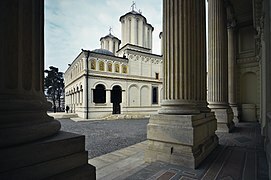 The same year was built the Church of St. Constantine and Helena in the city. 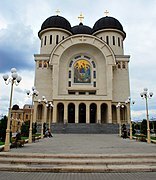 St. Stefan's Romanian Orthodox Church is a historic church built in 1924 in South St. Paul, Minnesota, United States. It was built for Romanian American immigrants who worked in the meatpacking industry. It continues to serve as a Romanian Orthodox Church. Teoctist (Romanian pronunciation: [te.okˈtist], born Toader Arăpașu; February 7, 1915 – July 30, 2007) was the Patriarch of the Romanian Orthodox Church from 1986 to 2007. Teoctist served his first years as patriarch under the Romanian Communist regime, and was accused by some of collaboration. He offered his resignation after the Romanian Revolution of 1989, but was soon restored to office and served a further 17 years. A promoter of ecumenical dialogue, Patriarch Teoctist invited Pope John Paul II to visit Romania in 1999. It was the first visit of a Pope to a predominantly Eastern Orthodox country since the East-West Schism of 1054. Theodor Dumitru Stolojan (Romanian pronunciation: [teˈodor stoloˈʒan]; born 24 October 1943) is a Romanian politician who was Prime Minister of Romania from September 1991 to November 1992. An economist by training, he is a leader of the Democratic-Liberal Party. He is currently a Member of the European Parliament for Romania, representing the Democratic Liberal Party (EPP-ED). The third cabinet of Miron Cristea was the government of Romania from 1 February to 6 March 1939. Miron Cristea was the Patriarch of the Romanian Orthodox Church since 1925. Cristea died on 6 March 1939.